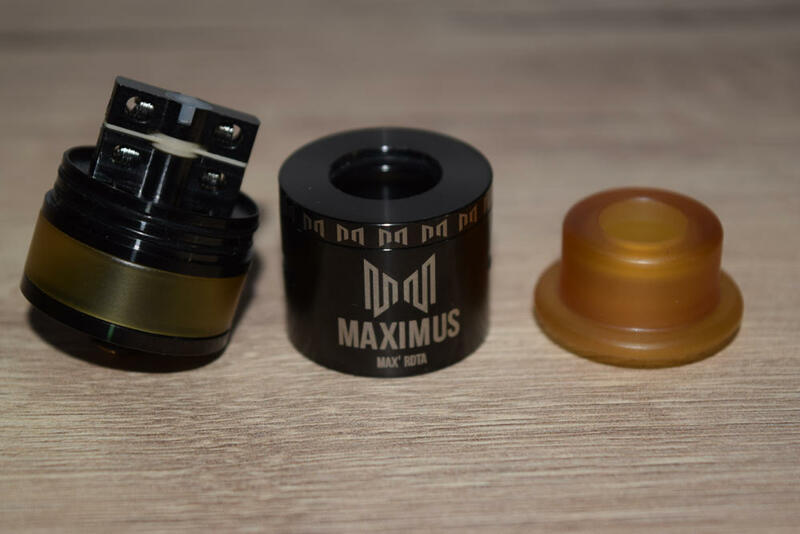 The Oumier Maximus Max is a 24-mm RDTA featuring adjustable airflow control, a square Velocity-style build deck and an ingenious top-filling system. But the thing that really caught my attention was the price of this atomizer. It costs under $20, which is pretty sweet for an advanced RDTA. I would even say suspiciously sweet, so let’s try this thing out and see if it’s as good as it looks on paper. I had never tried any Oumier products prior to this review. 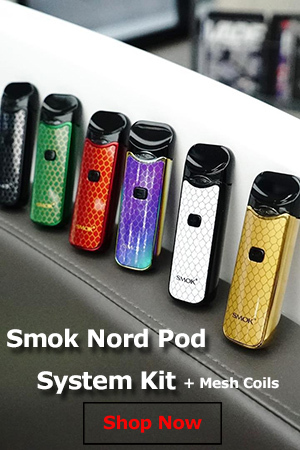 I figured they must be a new company, but upon checking their website, I learned that they have been producing all kinds of atomizers for a while now. 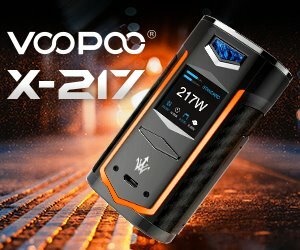 I guess they just have been getting the kind of publicity that large manufacturers, like GeekVape, have been, these last few years. Anyway, it was reassuring to know that these guys have some experience when it comes to atomizers. 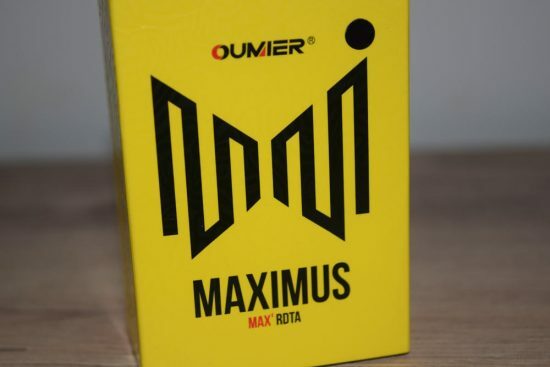 The Oumier Maximus Max comes in a small, yellow cardboard box, with a large “Maximus” logo on the front, as well as a list of contents, a flattering description of the device, company information and a scratch-and-check authenticity seal, on the back and sides of the box. Inside the box, we have the 24-mm RDTA and a spare glass tube sitting in a Styrofoam holder, and under that, we have a small bag of accessories and small parts. There is a small flat-head screwdriver, a bunch of spare o-rings, spare grub screws for the build deck, a silicone cap for the fill port, and two flimsy coil heads, which, just between you and me, are not really suitable for this device, at least if you’re looking to get the best vaping experience out of it. Overall, it’s a decent atomizer kit. Maybe they should have thrown in an informative leaflet or a user manual, but , to be honest, this is a straightforward device, so if you have any experience with RDTAs, you’ll probably figure out how it works in no time. 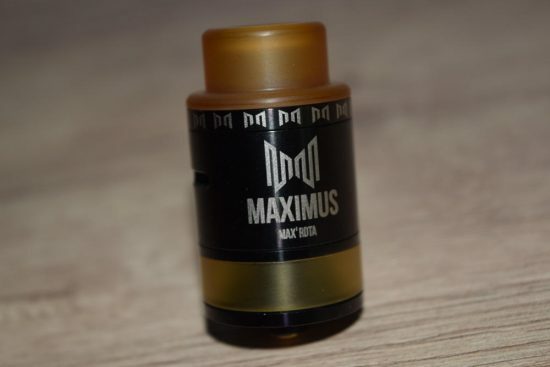 The Maximus Max RDTA is primarily made of 304 stainless steel and Ultem. There is actually more Ultem on this atomizer than on any I’ve ever used in the past. 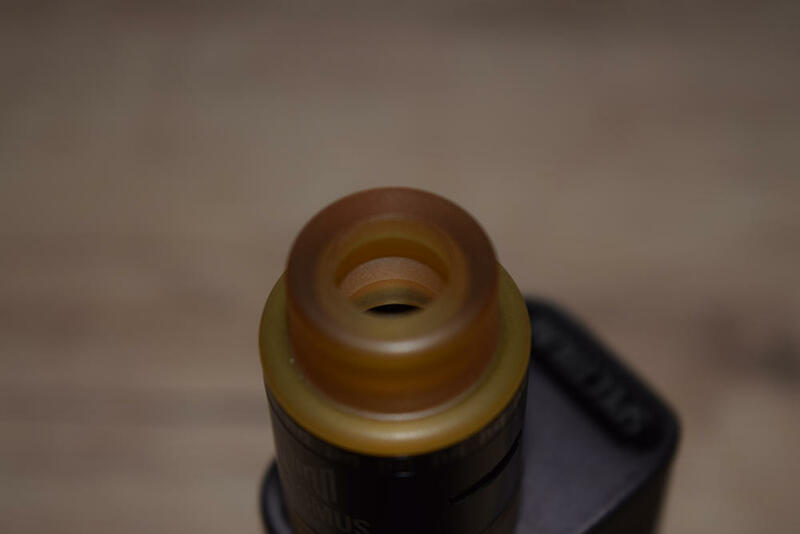 The pre-installed tank tube is made of Ultem, and so is the top cap/drip tip. I got the black version of the Maximus, and the black and gold combination actually looks very good, but the stainless steel version, not so much. Anyway, if you’re not a fan of Ultem, you can swap out the tank tube for the spare clear glass one included in the kit, and replace the top cap with any 810 Goon-style drip tip. The first thing you’re bound to notice when looking at the Oumier Maximus Max is the insane amount of branding. 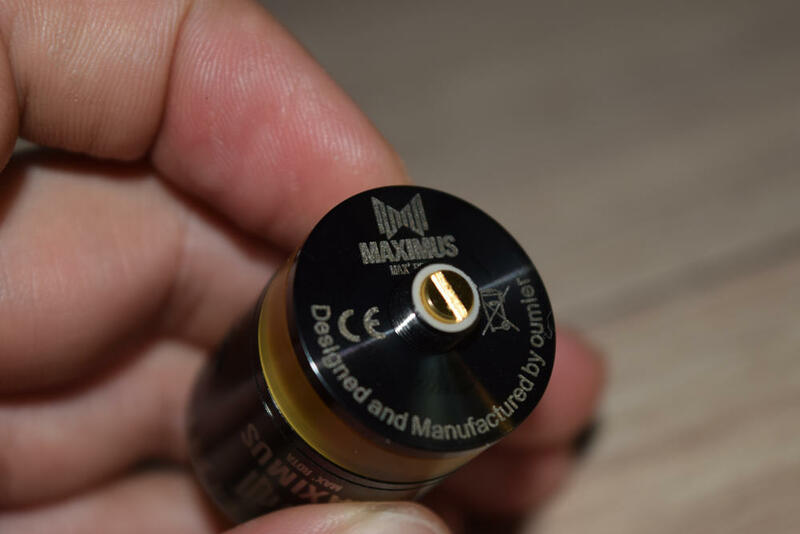 It has the “Maximus” name and logo on two sides of the stainless steel barrel, the rotating airflow control ring under the Ultem top cap is covered with small logos as well, and it has some extra branding on the bottom. It’s just too much, in my opinion, and it might put off some people. 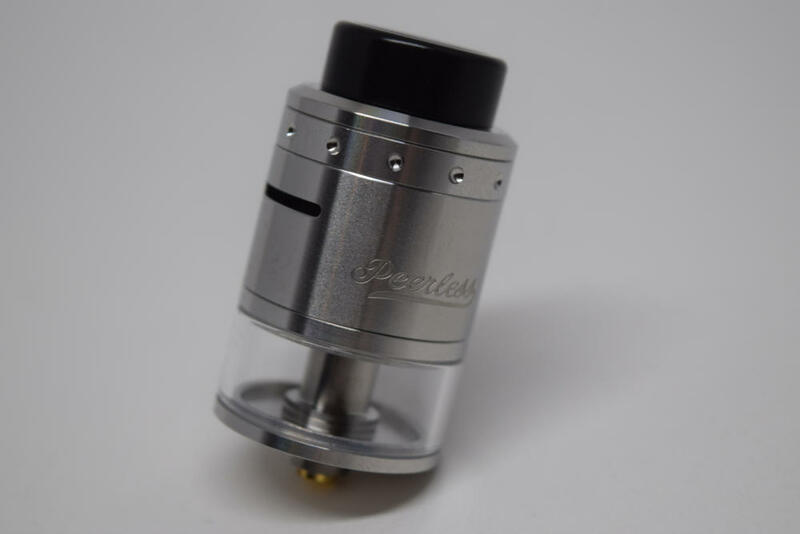 It measures 24-mm in diameter, and is 32-mm tall, so definitely not the largest RDTA on the market. Starting at the top, we have the Ultem top cap, with one of the thickest drip tips I’ve ever seen, the airflow control ring with two different-size slots on each side, the outer barrel of the RDA section, a large Velocity-style build deck with ample building space, a small tank section with an e-liquid capacity of 3 ml, and a detachable base. It’s pretty much your standard RDTA. The metal parts of this RDTA are a bit thinner than other, pricier atomizers, but overall, the build quality is pretty good. Threading is smooth, the tolerance of the various 0-rings is just right, and the atomizer is very easy to take apart and put together again, when you need to clean it. All these are big pros in my book, even though most people tend to ignore them, focusing instead on how the atomizer performs. Even though it’s essentially a classic Velocity-style system, the Maximum Max build deck stands out thanks to the design of the posts. They make up a stainless steel block, with the positive post on top, and the negative on the bottom. The post holes are 3.2 mm by 2.5 mm, so large enough to accommodate any type of wire, and the distance between the post holes is 6.6 mm. Another interesting thing about the posts is that they also house the fill-port. 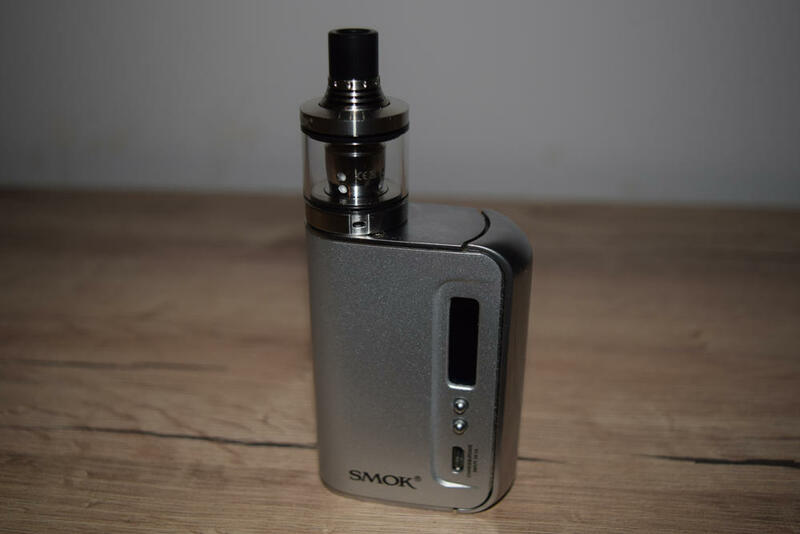 As you can see in some of the pictures, the port sits on top of the posts, and all you have to do is insert a dropper or a silicone bottle in there and squeeze, to fill the tank. It’s an interesting design that I know has been used by other manufacturers in the past, but this was the first time I had a chance to try it for myself. The only downside of this system is that you cannot fill the tank with a gorilla bottle, because they just don’t fit into the slot. That’s a con! 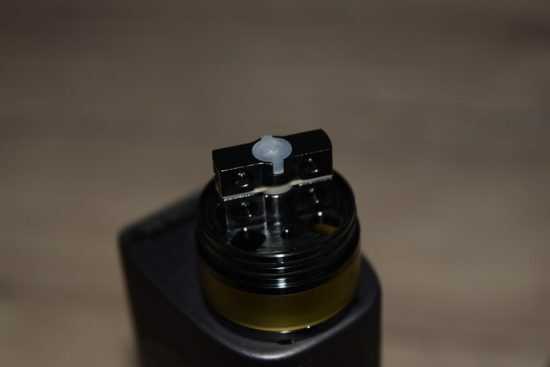 The bottom of the build deck features four square holes through which the cotton leads go into the tank, as well as a fifth, smaller hole, which releases the air as you fill the tank with juice. 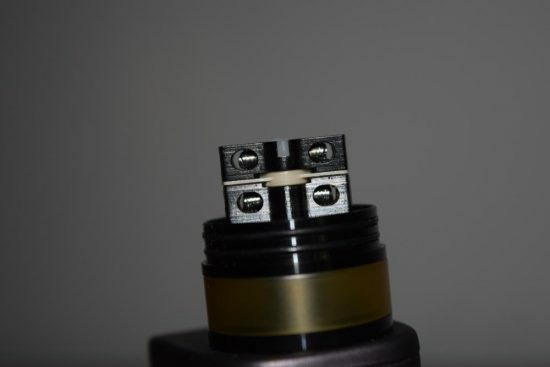 The wicking holes could be a bit larger, but I’m not complaining, they’re ok.
As always, I recommend taking the atomizer apart and cleaning all the components thoroughly, before using it. Once everything is nice and clean, you can start working on installing your coils and wicking them. As I mentioned in the beginning, this atomizer does come with two coils, but I wouldn’t recommend using them. They are your basic, simple wire coils, so they’re just not suitable for this sort of advanced RDTA. If you don’t own any exotic wire or pre-made coils, I suggest getting some Claptons or Alien coils for a really awesome vape. If you’ve ever used a Velocity-deck atomizer before, you probably already know that installing the coils is a breeze, so I’m not going to dwell too much on this. 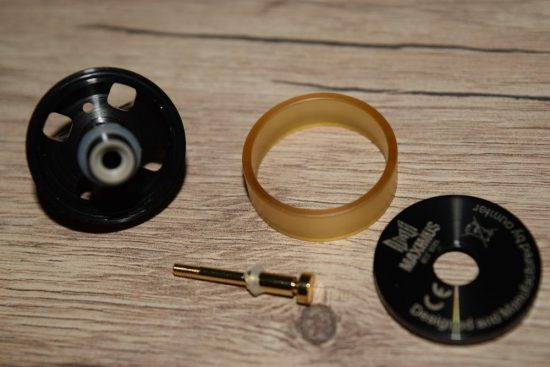 Once your coils are in place and the grub screws fastened, it’s time for the most important part of the setup, the cotton wicking. RDTAs are tricky to wick. Leave the cotton leads too thick and the juice will have a hard time reaching the coils, but if you make them too thin, juice is going to spill out every time you tilt your device. You basically have to get the perfect balance, in order to enjoy a pleasurable vaping experience. Getting it right requires some trial and error, but once you get the hang of it, you should have no issues. So don’t be discouraged if your first attempt isn’t perfect, just try again. Because the tank section is so short, you should cut the cotton leads where they are barely visible at the top of the tank. Some people like them long, where they reach the bottom of the tank, but I noticed that the shorter the wicks are, the better they soak up the juice. Just make sure to tilt your vaporizer as the juice level in the tank drops, to make sure it reaches the cotton. Once that’s over with, drop some juice on the cotton, fill up the tank, put the RDA section back on, and you’re good to go. 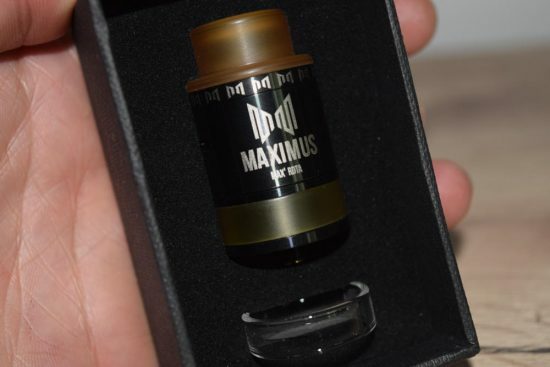 The performance of the Oumier Maximus Max, or any other atomizer, for that matter, is greatly dependent on your build. If you’re planning on using those two stock coils that come in thekit, you’re going to be very disappointed. But slap a pair of Claptons and wick them the right way, and this thing will definitely surprise you. For a $19.99 atomizer, this thing is just awesome. First of all, the vapor production is insane, but, again, you need to have a good quality build to make it happen. I’ve been rocking it with a couple of Clapton coils, with a combined resistance of 0.25Ω, at around 80W, and I can say that this thing puts out monster clouds. The adjustable airflow plays a huge part in vapor production, so if you care more about the volume of vapor and are willing to compromise on flavor, I recommend leaving the large slots wide open. That’s a bit too airy for me, so I prefer the slanted slots, and they amplify the intensity of the flavor, as well. In terms of flavor, it’s right up there with the best RDTAs on the market. Is it as good as an RDA. No, definitely not. I have been vaping the Jam Monster Apple juice I recently reviewed, and it’s still very good, but it doesn’t really compare to the clear, bold flavor I get from a good RDA, like the Peerless Special Edition. Still, it’s definitely better than most tanks, and you don’t have to keep dripping juice onto the coils every few puffs. There are some cons I should point out as well. First of all, the Maximus Max RDTA can only be used in dual coil mode, which might put some people off, and there’s also the 3 ml capacity of the tank. It’s not a lot, but then again, this thing is so easy to refill that I don’t really mind having to top it off more frequently. Other than those two small cons, I really haven’t experienced any issues with the Maximus. For the low price of $19.99, the Oumier Maximus Max is a must-buy, no doubt about it. Build quality is above average, and in terms of performance, it’s honestly better than some other more expensive RDTAs I’ve used. It’s easy to build on, you have loads of airflow adjustment options, and the performance is pretty darn impressive. I was a little skeptical about it at first, not knowing anything about Oumier, and seeing that the metal parts were a bit thin, but this thing definitely surpassed my expectation. If you’re looking for a cheap high-quality RDTA, you should definitely consider the Maximus Max. The Oumier Maximus Max RDTA was provided, for the purpose of this review, by Urvapin. 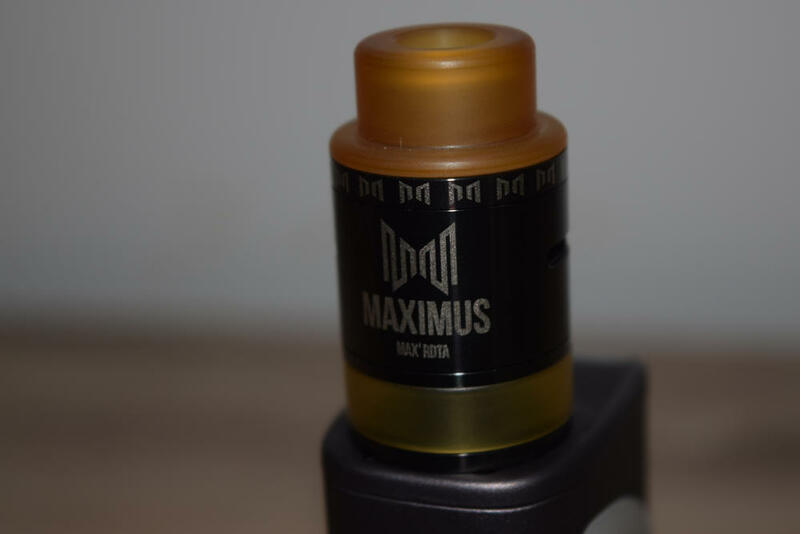 Looking for a special price on the Oumier Maximus Max RDTA? Check out this great offer.